B’nai B’rith Camp will always be a home to so many special experiences; singing together, lighting Shabbat candles, or making a lifelong best friend. I am incredibly honored to be a part of an incredible community and help create these experiences for our campers. Every year as our summer campers depart from Camp and I begin to reflect on the challenges of successes of the summer, another group of campers descend upon BB Camp for our annual Men’s Camp. I am lucky enough to shift from my role as Camp Director to being a Men’s Camp Camper in a cabin of friends at an encampment with over 150 participants. 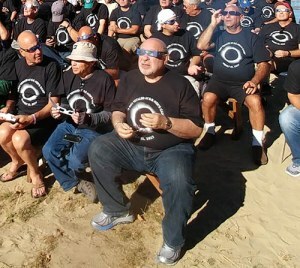 This year’s encampment overlapped with the eclipse, bringing added excitement and meaning to the 87th annual Men’s Camp. Since 1931, the members of Men’s Camp have gathered each year at BB Camp for a week-long encampment. Many of the adult campers started at BB Camp as kids, continuing their connection to BB Camp throughout their lives. In true dor l’dor fashion, men from ages 24 to 100 return each year to BB Camp, staying in the same cabins and using the same facilities as our summer campers. This year we not only raised more than $267,000 for camper scholarships, we also were able to enjoy a once in a lifetime event together as a strong multigenerational community. 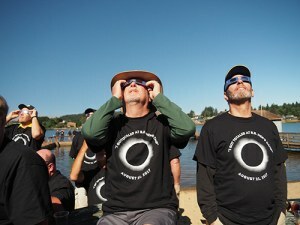 BB Camp is located on the Oregon Coast and in the path of totality for Monday’s eclipse. All of us at Men’s Camp gathered by the shores of Devil’s Lake with our glasses and lawn chairs and spent the morning soaking in the experience. As totality approached, Rabbi Arthur Zuckerman offered a blessing and we all sang Oseh Shalom as we eagerly waited with increasing anticipation. 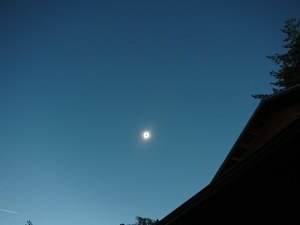 At totality, darkness overtook us and we all removed our glasses and were safely able to look up at the eclipse for a short period. In my few moments looking up at the breathtaking sight above, it was so obvious to me that there was no better place in the world to witness the eclipse. To have experienced this once in a lifetime event at my home, among such an incredible community, is something that I will cherish forever. Written by Ben Charlton, Director of BB Camp and avid Men’s Camper.